If you have never been to the Ridgefield Farmers' Market, this month would be a great time. The market is kicking it into high gear for the end of the growing season. In addition to fantastic produce, artisan cheese, and fresh baked bread, they'll be celebrating the harvest with a chef series featuring some of the area’s most innovative farm-to-table restaurants. The chefs will be doing cooking demos and tastings as well as giving you take-home recipes. This charming downtown restaurant has been a local darling since opening in 1999. Last year Owner Sal Bagliavio and new Executive Chef Forrest Pasternack revamped the New American menu, taking a new farm-to-table approach. Low Country cuisine is at the heart of this “Southern Table and Refuge” located in SoNo. Mama’s Boy offers hearty land and sea faves as well as creative cocktails that even the most discerning southern bells and good ol’ boys would be proud of. Featured farms and artisans include Butterfield Farm Company (Suffield, CT), Garden Of Ideas (Ridgefield, CT), Riverbank Farm (Roxbury, CT), The Hickories (Ridgefield, CT), Wave Hill Breads (Norwalk, CT) and Whistle Stop Bakery (Ridgefield, CT). 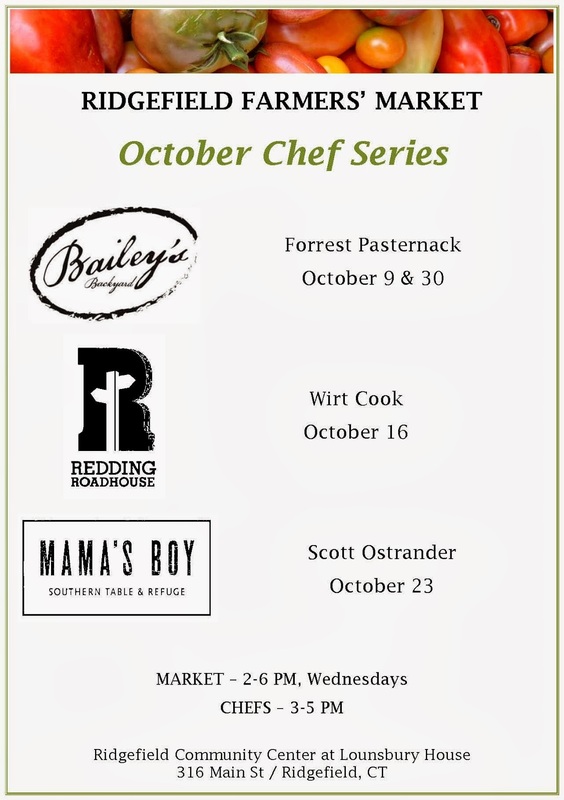 The Ridgefield Farmers Market is on Wednesdays from 2 to 6pm, with the chef series going on from 3 to 5pm at the Ridgefield Community Center at Lounsbury House, 316 Main Street in Ridgefield. Sounds like a delicious way to celebrate the bounty of fall.